Why is buy-to-let still the best option for investors? A rise in stamp duty and the imminent arrival of mortgage tax relief restrictions may have had an adverse impact on landlords, but the buy-to-let market continues to offer the greatest returns of any investment type. 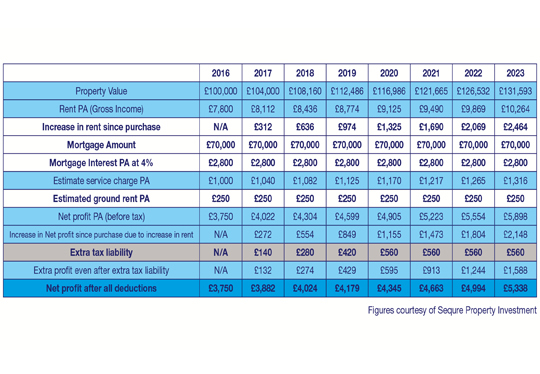 New figures from Sequre Property Investment show a landlord who bought a property in 2016 at a cost of £100,000 will still benefit from both capital growth and rental profits in the coming years, even once the new regulations are fully implemented. Based on house prices and rents growing by four per cent a year, it found investors will enjoy net profits of between £3,750 and £5,338 a year until 2023, while a property worth £100,000 last year is forecast to rise in value to £131,593 in a further six years. It means buy-to-let will continue to offer a higher return than any other investment opportunity, such as stocks, bonds and ISAs. Allison Thompson, managing director at property specialist Leaders, says: “Tax and stamp duty changes do not alter the fundamental factors that continue to make buy-to-let an incredibly attractive and rewarding market to investors. “The results show investors with a £30,000 deposit can purchase a property for £100,000 and, by 2023, record a yield in excess of five per cent. Even after tax relief levels out in 2020, returns continue to go up each year. Many existing investors have already opted to absorb slightly higher costs as a result of the government’s legislation in order to remain in the buy-to-let market and benefit from its high returns and potential for further growth. Allison adds: “There is no doubt the buy-to-let sector has received some bad press in recent months, but there is no getting away from the fact it delivers a great return to shrewd investors. And at a time when savings accounts and pensions are falling short, property investment can be a crucial way for people to fund themselves through retirement. Leaders can support investors at every stage of their buy-to-let journey and a comprehensive database of available buy-to-let properties – hand-picked for their outstanding investment potential - can be accessed via its Property Investment Hub. For more information on the buy-to-let market please contact your local Leaders branch.